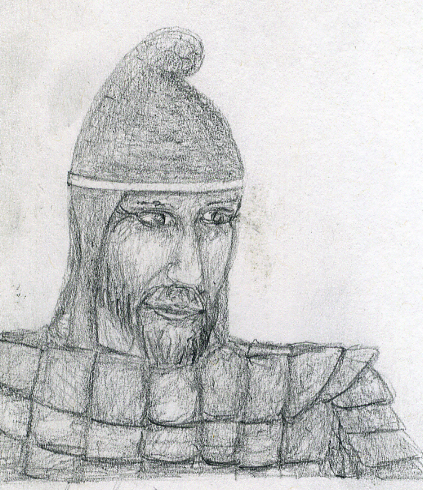 A nomad warrior from the great easter plains, this brave warrior can be a great addition as an NPC or player character. As a nomad he is a tallented horse archer, master of both the bow and riding. These skills combine to form a formitable fighter, quick and deadly in battle. These warriors have adapted to life on the steeps, they use what nature has provided them to craft their armor and weapons. His armor is made of sliced and hardened horse holves, his bow is a composite of horn and wood and his arrows are bone tipped. Sakasyth can seem strange to those that don’t know his people. He believes everything is living and has a great respect for nature. He often makes offerings to rivers, trees or even rocks that he comes upon. Sakasyths nature is gentle and he enjoys sitting and smoking cannabis. Sakasyth prefers open spaces and dislikes cities, he hates dungeons and will avoid them if possible. Besides dungeons his spirit is adventerous and brave. He is deadly with his bow but also has knowledge of healing and will be useful in dressing wounds. This entry was posted on Saturday, December 6th, 2008 at 11:08 pm	and is filed under NPC Warriors. You can follow any responses to this entry through the RSS 2.0 feed. You can leave a response, or trackback from your own site.